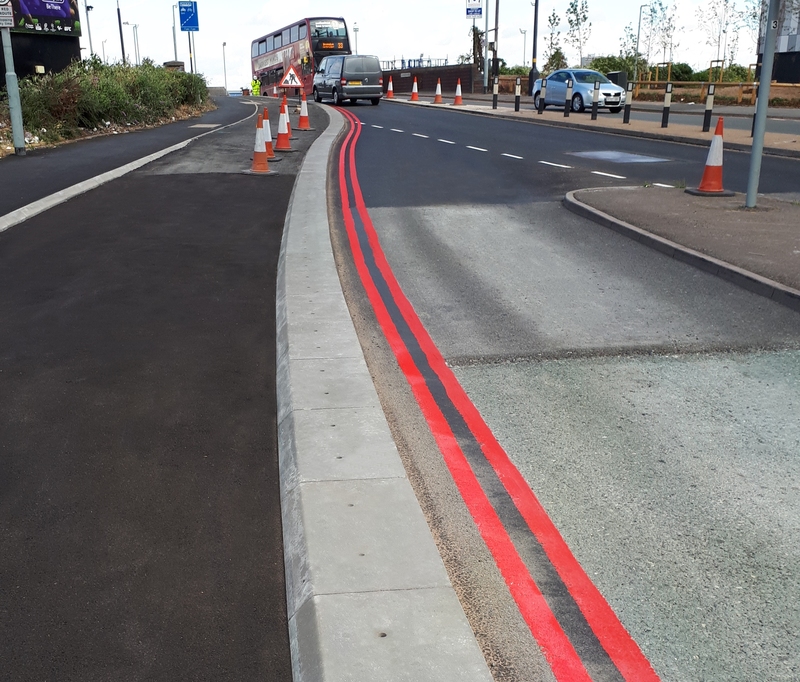 Charcon Hard Landscaping, a division of Aggregate Industries, has joined Birmingham’s Cycle Revolution by supplying 955l/m of its award-winning Cycle Kerb for the city’s new, multi-million pound cycle highway. Birmingham City Council’s vision for its Cycle Revolution is to make cycling an everyday way to travel by improving road safety and cycling conditions, with 10% of all trips in the city to be made by bike by 2033. The initiative includes creating high quality cycle routes on two key roads into Birmingham: the A34 and A38. Amey, the company delivering the cycling infrastructure improvements in partnership with Birmingham City Council, have installed 299l/m of Charcon’s innovative Cycleway Segregation Unit to create the first section of a 4km, two-way, fully segregated route which shields cyclists from passing traffic, even when on the blind side of a lorry or bus. The standard, high-performance segregation unit has been used for the majority of this section. And whilst it delivers visually, a new kerb featuring the aesthetics of granite was created especially for certain conservation areas which demanded enhanced visual appeal. The bespoke design features a bull-nose edge running along the carriageway, capable of withstanding vehicular impact, while a full batter profile on the cycleway side significantly reduces the chance of cyclists catching a pedal. A frog in the base of the unit improves the key into the bedding material, facilitating a swift installation as the units can simply be dropped into place – an attractive design feature for contractors under pressure to minimise impact to traffic, residents and businesses while works are ongoing. Due to the swift delivery and installation of phase one, a further 656l/m of Charcon’s Cycleway Segregation Unit has been specified for phase two of the project. With Birmingham ranked as the third most populated urban area in the United Kingdom, its 1.26 million residents are on a daily basis exposed to the detrimental effects of traffic congestion and man-made air pollution. Despite this, the city holds its position as the top UK regional city for quality of life, with initiatives such as Birmingham Cycle Revolution specifically engineered to make the city healthier, greener, safer and less congested. For further information, visit charcon.com or contact the team via 01335 372 222 or landscaping@aggregate.com.